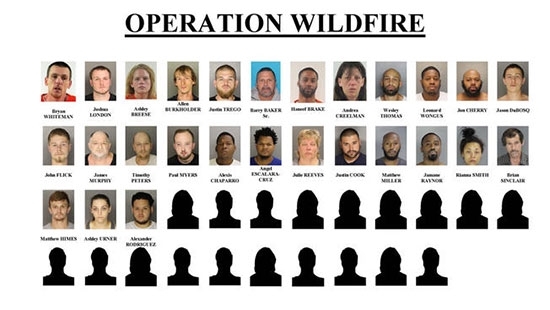 A two-month long drug bust operation in Chester County has led to charges against 46 street level dealers across the county. District Attorney Thomas Hogan announced the crackdown today. It was nicknamed "Operation Wildfire." "The police bought heroin, Oxycontin, Percocet, Vicodin, morphine, MDMA, diazepam, and Xanax, as well as traditional drugs like crack cocaine and crystal methamphetamine," the statement said. "The drug deals took place in every region of Chester County." Most of those charged have already been arrested. Hogan says it is just part of the effort to help combat the crisis of overdose deaths in the county. In 2015, there were 60 deaths. Last year, there were 97, and so far this year they are on pace for 150. The Delaware teenager who fell from a ride at Six Flags Great Escape in New York on Saturday night was released from the hospital on Monday. The 14-year-old girl was treated at the Albany Medical Center after falling around 25 feet into the arms of bystanders below the Sky Ride. She was in the two-person gondola with her brother. Police say that it was her own actions that caused her to slide underneath the ride's restraining bars and that the ride was functioning properly. She hung onto the car and dangled above the crowd before falling safely into a group of people who had gathered underneath to catch her. The park has closed the ride to do their own investigation. Police are also continuing their investigation. An 18-year-old man is dead after shots rang out in South Philadelphia on Monday night. It happened around 11:30 p.m. on the 2300 block of Marshall Street. The teen was outside his home with a friend when an unknown shooter opened fire. The victim was hit in the back while running from the gunfire. He managed to get inside his home where his family saw him bloodied from his injuries. Police drove him to Thomas Jefferson University Hospital in critical condition. He died around 1 a.m. Tuesday morning. Police are looking into surveillance footage from nearby homes and businesses. So far they do not have a possible suspect or a motive.